What gives a documentary film its power? Is it the inherent fascination of a particular subject (such as a group of Palestinians touring Israel), or the urgency of an issue (like the India-Pakistan nuclear faceoff), or the filmmakers’ degree of access (to a presidential candidate, to Texas Pentecostals, to the elusive French philosopher Jacques Derrida)? All these qualities could be found among the 29 feature documentaries presented at last spring’s 45th San Francisco International Film Festival. But one film went further. In presenting the festival’s Golden Gate Award for Best Documentary to German filmmaker Thomas Riedelsheimer for Rivers and Tides, the jury said simply that the film “reaffirms the documentary form as a cinematic form.” It is the strength of the San Francisco Festival that it presents not just a range of documentary topics but a range of cinematic aspirations as well. Rivers and Tides is that rare instance of one art form doing justice to another. 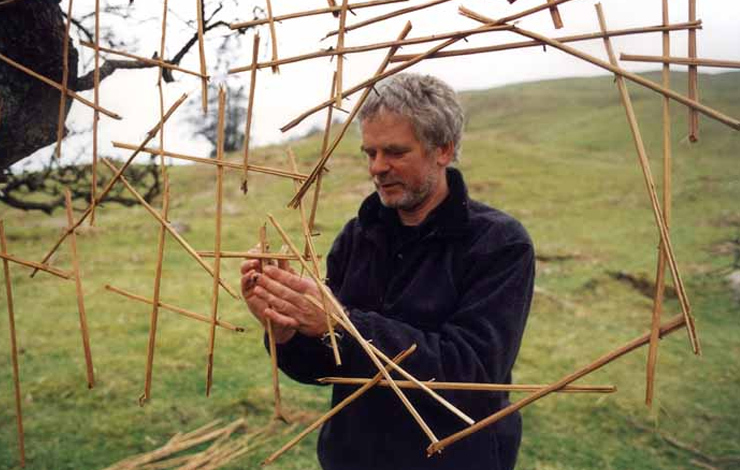 Without commentary, the film follows Scottish artist Andy Goldsworthy as he hand-crafts ephemeral sculptures from materials found in nature, which then melt in the sun or drift away on streams and tidepools. “My goal is to show why people are doing certain things,” said Riedelsheimer. “Not the work, but the person.” But he added, “Of course, I tried to capture the beauty. The hazelnut leaf line going down the river was the most beautiful thing I ever saw." Few of the documentaries at San Francisco could match the beauty and precision of Rivers and Tides, although one that came close was Mark Kidel’s Ravi Shankar: Between Two Worlds, a film that has the patience to present quiet images—of daily life and ritual in Benares, Shankar’s hometown—as well as extended sequences of the master’s sitar playing. Several of this year’s films veered away from artistic precision toward either narrational excess or rough-hewn spontaneity. Anand Patwardhan’s three-hour War and Peace wanders all over the map, from India to Pakistan to Hiroshima to Washington, DC, but in the process the filmmaker conveys the nuclear naiveté that afflicts the troubled Indian subcontinent. Ruby Yang’s China 21 lacks a center—it is ostensibly about the first generation to come of age under China’s single-child policy—but the film provides such intimate glimpses into Chinese life that you don’t mind rambling along with it. In Photos to Send, Deirdre Lynch stays close to Ireland’s County Clare as she tracks down subjects captured in Dorothea Lange’s 1950s photographs. Yet Lynch, too, drifts away from her topic, venturing into tales of clerical abuse and issues of reforestation, and she can’t resist shooting the kind of details—a dog sitting in the middle of the road—that confirm Lange’s dictum: “Small things seem to characterize Ireland.” Two new documentaries from South America are particularly noteworthy. In News from a Personal War, João Moreira Salles and Katia Lund provide some complicated historical background to Rio de Janeiro’s recent drug wars, but the images that linger are the crosscut testimonies of teenaged dealers and cops who are not much older, and those moments when the camera prowls the narrow passageways of Rio’s hillside favelas, rendering the slum’s gun battles quotidian, almost banal. From Chile comes Patricio Guzmán’s The Pinochet Case, the third installment in his long-running investigation into the dictatorship that replaced the democratically elected presidency of the Marxist Salvador Allende. The film builds a dramatic structure—the indictment of former Chilean dictator Augusto Pinochet by a Spanish judge and Pinochet’s subsequent house arrest in Great Britain—but what holds it together is the litany of horrors related by the victims of Pinochet’s regime. Two of the most popular documentaries at the festival went the digital, handheld, vérité route. For Journeys with George, Alexandra Pelosi recorded life “inside the bubble” on the press tour accompanying George W. Bush’s presidential campaign. Pelosi was dismayed when a quick poll of the audience revealed that her film made viewers like Bush more, not less. But that response was in synch with the film’s underlying message, that Bush so charmed and disarmed the reporters that they went easy on him. Another video-recorded bus journey, Ra’anan Alexandrowicz’s The Inner Tour, follows a Palestinian tour group around Israel. The film is wrenchingly sympathetic without being anti-Israeli. In Tel Aviv, one of the Palestinians asks a leery cab driver to take him to the site of Yitzak Rabin’s assassination so he can pay tribute to the Israeli leader’s memory. At the press breakfast announcing the festival’s award-winning films—which included Rivers and Tides, Photos to Send, Gail Dolgin and Vincente Franco’s Daughter from Danang and Laleh Soomekh’s short, Dear Judge—Golden Gate Awards jurist Frederick Marx, producer of Hoop Dreams, made an apt suggestion. He said the San Francisco International Film Festival should simply commit itself to being the leading American festival for documentaries. The idea makes sense, because in many ways the festival already has achieved that status. Tom Powers is a film writer and teacher and the former editor of Release Print, the magazine of Film Arts Foundation.